Pilot Gary Kraft of the Aspen-based conservation group EcoFlight banks his Cessna 210 to the north of the Bears Ears — two distinct buttes in southeastern Utah that are sacred to Native American tribes and the namesake features of a national monument created by former President Obama. It's a crystal-clear morning in December where the colors jump out — the deep green of subalpine firs give way to the browns of dried grasses and the red sandstone of the Bears Ears buttes. Far to the south are multi-colored cliffs and deep gorges cut into Cedar Mesa. A three-member team from the British Broadcasting Corp. occupies half the plane. They ask for and receive permission from Kraft to open the windows so they get clear video and still pictures of the spectacular scenery unfolding from a bird's-eye view at 10,500 feet in elevation. Wind roars into the passenger compartment, making speech impossible and forcing the passengers to zip their jackets tighter. Kraft ends up making three passes over the national monument that morning with three different groups of journalists, not only the BBC but also Outside Magazine, Yale News and a German TV station, among others. (Fox News and Wall Street Journal reporters participated in a flyover earlier in the year.) In addition to filing their own report, the BBC reporters created coverage that would be used by National Public Radio and PBS the next day when President Donald Trump announced a decision to drastically reduce the acreage of the national monument. Thanks to the work of the BBC team and other journalists, Americans caught a glimpse of the magnificent setting that Trump decided wasn't worthy of monument designation. While the outcome wasn't what EcoFlight and its allies wanted, the footage and photography will be used in multiple news reports as a court battle unfolds over the legality of Trump eviscerating the monuments. EcoFlight celebrated its 15th anniversary in 2017. Over that time it has whisked thousands of journalists, policymakers of both political parties and stakeholders such as ranchers, scientists and environmentalists up in aircraft for an aerial perspective of landscapes at the center of one environmental debate or another. "The airplane is such an incredible tool," said Bruce Gordon, who founded EcoFlight and serves as executive director and its other primary pilot. The advantage is people in a plane have a 360-degree view. They aren't trying to absorb the vast Western landscape by looking left and right out a car windshield. That creates a unique, broader perspective and often results in greater understanding of issues. Gordon calls it conservation in the cockpit. EcoFlight, he said, is the environmental air force. "We can give the land a voice," Gordon said. Basalt-based photographer Peter McBride learned the value of the bird's-eye view when he enlisted EcoFlight's help on his project tracing the Colorado River and what happens to it before it reaches the Sea of Cortez. "In general, they offer a perspective on water and natural resources that we don't get on the ground," he said. He recalled he once gained a new perspective on the effects of logging in a national forest via the air. A 50-yard-wide swath of trees was left untouched next to a highway but beyond that the forest was clear-cut. The perspective wouldn't have been possible without the flight. McBride was so impressed with EcoFlight's mission that he started volunteering a few years ago on its board of directors. EcoFlight works with about 300 conservation groups on efforts such as preservation of national forests from oil and gas development, opposition to uranium mining on the rim of the Grand Canyon, expansion of coal mines in Wyoming and various effects of climate change. In many cases, its conservation partners ask EcoFlight for assistance getting people up in the air for a different perspective. "People now see this as a tool they try to factor into their (planning)," Gordon said. In other cases, EcoFlight takes the initiative to offer flights, such as with the Thompson Divide oil and gas controversy west and southwest of Carbondale (see related story). It aims to help direct policy in those cases. "What stokes my passion and fire is the people I work with, the donors, and the scientists and activists, the people on the ground," Gordon said. The groups accomplish more by working together. "All of these conservation groups are a piece of the puzzle," he said. Josh Ewing is executive director of Friends of Cedar Mesa, a conservation organization fighting to preserve Bears Ears National Monument. It was in the thick of the campaign to create the monument, then the effort to try to save it and now to restore it. Ewing tries to educate people on why Bears Ears would be a national park anywhere else on Earth. Getting people up in the air in EcoFlight flyovers have proved invaluable. "The fastest way to demonstrate the scenic beauty of the monument is from the air. 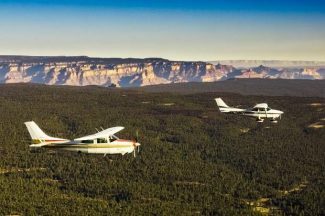 You can't help but be impressed flying over the sinuous canyons of Cedar Mesa, the verdant Elk Ridge, and the dramatic towers in Valley of the Gods," Ewing said. "Nothing makes an impression more powerfully than a personal experience, and EcoFlight makes possible a once-in-a-lifetime opportunity that leaves a lasting impression on everyone who has the opportunity to fly with them." Gordon's partner in life and at EcoFlight is Jane Pargiter, who joined the organization in 2004 and is vice president. Pargiter grew up in South Africa and was a lecturer at a university when she got involved in the anti-apartheid movement. She got blacklisted for her activism and moved to the U.S. for safety at the urging of her father. She ended up in Aspen and found her activism spirit renewed by EcoFlight. "What it did was it enabled me to have the kind of passion I had when I was fighting the end of apartheid. It's the same sort of thing where you are using your soul and your heart but you're also using your mind," Pargiter said. EcoFlight averages about 400 hours of flying with people per year but 2017 was particularly busy. The number of flights jumped 40 percent. Journalists were present in 63 percent of the flights last year. The influence of news coverage that results from taking reporters up in the air is incalculable. EcoFlight also has multiple files of still photography and video of imperiled Western landscapes that media outlets can use simply by giving credit. The organization also takes a large number of high school and university students up in the air each year to study environmental issues. The nonprofit organization's budget for 2017 was about $480,000. Just as rewarding as the media coverage and work with students, Pargiter said, is taking up elected officials and policymakers on different sides of issues and seeing a meeting of the minds unfold. "The plane happens to provide a really great platform for that because you're putting people from different backgrounds into this tiny little bubble of a cockpit together where they're physically touching, they're all nervous, they're all excited," she said. "So they're sharing similar emotions even though they could be from opposite sides of the aisle politically or morally even, but they find that they have a lot in common so it allows them to suddenly see the landscape in a different way." Once on the ground, parties often discuss what they saw and that's when the value of the flights becomes evident. "They learn that they're really not that far apart," Pargiter said. In this national political climate, that's more important than ever, she said.